"She remains the funniest person I know, with a piercing and dry wit and delivery that punctured pretensions and made you laugh at yourself." Our smoking habit was the second bond. (The fact we both quit later that year would be a third bond). Then we started to talk and never really stopped. We were, after all, wordsmiths and we loved language, especially in the service of dissecting the psyches of some of our coworkers. She was my best friend at work for 20 years. The job was her first 9-to-5 experience in years. She lived with an actor and acting teacher (later her husband) in a downtown loft and led a very downtown life. Among her set, she was the only one setting an alarm clock, putting on “real clothes” and heading to an office every morning. I’d come from book publishing, which at least had an aura of creativity, but the rest of my life was hopelessly conventional. Nevertheless, our bond proved unshakeable for the next twenty years. When she retired and moved out to California, we phoned and emailed frequently, but the loss of her daily presence felt like a missing limb. Then the job brought me to San Diego in late 2006, and we arranged to meet in La Jolla. We rented two rooms at a small beachside motel and luxuriated in four (husbandless) days of eating, drinking, talking and walking the beach. Four months later she was dead. Sharon died instantly, far too young, on the deck of her California home in January 2007. Just 62—barely a year retired from our mutual employer. What struck everyone who knew her was how healthy she was. Slim and fit, she ate carefully and exercised religiously, an early disciple of Pilates. It might have been an aneurysm or a stroke, some said later. I never found out for sure. Her husband was in shock and unable to talk, diagnosed with a form of PTSD. (It happened in front of him as they drank their coffee on a sunny Sunday morning.) I didn’t want to bother her mother or sister. But really, how much does the cause of death matter? When it happens so unexpectedly and suddenly, it’s the fact of death itself you can’t get past. She wasn’t the first person in my life to die, but she was the first peer and close friend, which is surely why her death continues to reverberate in my life. I think of her often and miss her still. But she’s also become a kind of symbol for me (a notion she’d find hilarious), reminding me not to take anything for granted or postpone anything important or pleasurable. Later, other work colleagues and friends would say, “How lucky you had that last time together.” Well yes, I would think, but a part of me rebelled at the thought. Because it was death, after all, that had transformed a commonplace experience—a pleasant visit with a good friend—into something out of the ordinary, adding a weight and darkness it wouldn’t otherwise have had. And I really didn’t want to remember my final time with Sharon like that. 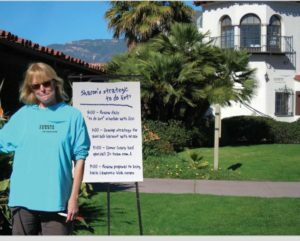 Sharon was one of the most generous people I’ve ever known—with her time, her insights (always on point) and her incredible ability to cut through crap with just a few well-chosen words without ticking people off (most people anyway). In a firm like ours that prided itself on so-called “healthy” competition, there was indeed an edge of competitiveness in our relationship. But it was always friendly and if one of us got the nod for an assignment we both wanted, we’d invariably find a way to work on it together. We wrote virtually every major brochure our company produced in the late ‘80s and ‘90s sitting on my terrace and drinking endless pots of coffee or tea. And in retrospect, I think the competition strengthened our bond and heightened the intensity of the relationship. She remains the funniest person I know, with a piercing and dry wit and delivery that punctured pretensions and made you laugh at yourself. It’s a talent that I wish I saw more of, especially these days, when humor and civility seem in ever-shorter supply.